It was George Box, a statistician, who is accredited with the quote “all models are wrong, some are useful” – but it is a frequently quoted and well attested observation. Over my twenty-plus years of modelling, the balance between ‘wrong’ and ‘useful’ in any one model is a constant tension to hold, and to use creatively. When I was first asked to model the General Practitioner workforce, some seven or eight years ago, it was in the context of thinking about the impact of changing the length of training from three to four years. That model was ‘useful’ because it suggested that the overall impact would be relatively small over the medium to long term, but it was ‘wrong’ because we discovered how little we knew about the number of GPs who seemed to disappear from our data between training and taking up a substantive post! Our next major attempt at the assault on understanding future GP requirements came with the commitment to see an additional 5,000 wte across England by 2020. Our model came up with an answer! It was a qualified yes, this is theoretically possible. But it was ‘wrong’ (although some still hold out hope) because the hopes and expectations of those at the end of their training were not addressed adequately. What about retention, and what about attracting newly qualified doctors and medical students to a career in General Practice. We then applied similar modelling to some STP footprints. We found that some STPs had been left with impossible targets leading to heroic assumptions. So once again models could be built that set out the art of the possible but could be ‘wrong’ because replicating a model in the real world is never straightforward. Which is where a model’s usefulness really lies. Models highlight the real-world challenges of implementing our desired futures, they stretch our human ingenuity and they demonstrate the need to work together to realise these futures. And where we fail then a model can be the mirror that we look in for part of the answer, as it acts as a neutral, but critical friend, highlighting the gaps in our knowledge and understanding. So, we’ve modelled the General Practice workforce again. Not because we think that we’ve finally got it right, but because we think it will be useful. We’ve learnt the importance of seeing the General Practitioner as a part of the wider workforce and we’ve recognised that change can take time – all the things we perhaps assume can be done tomorrow will only flow from today’s actions. 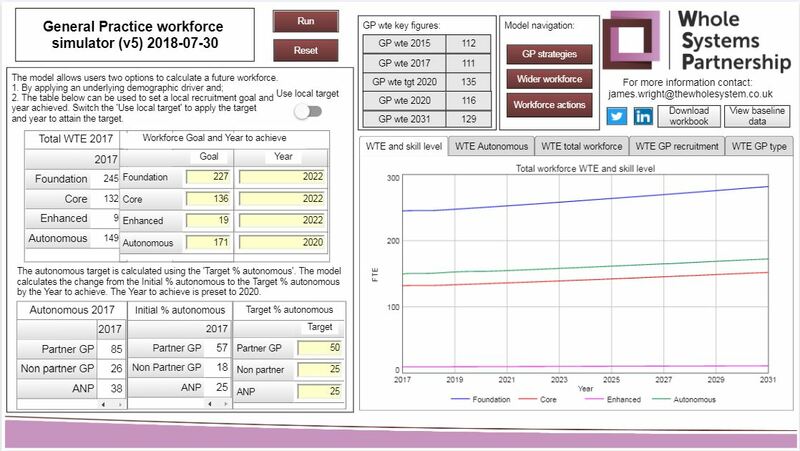 We’re proud of the General Practice Workforce Simulator and have already seen how it can be useful for clients, but we’re equally expecting that we’ll be told it’s ‘wrong’!